Finally, in the 15th escapade of Las Vegas p.r. flack Temple Barr and her know-it-all tomcat, Midnight Louie (Cat in a Midnight Choir, 2002, etc. 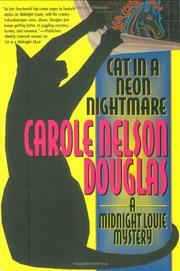 ), Douglas gets around to tying up most of the loose ends she’s been carting from book to book. The first sign of knotted threads comes when radio talk-show host and former priest Matt Devine, in an attempt to thwart his obsessive stalking by renegade IRA operative Kitty the Cutter, checks into the gaudy Goliath Hotel, pays for a gorgeous call girl named Vassar, and plans on relieving himself of his innocence. Unfortunately, after Vassar leaves his room, she wanders to the atrium balcony and tips over. Suicide? Accident? Murder? Hoping to snare Max Kinsella, former spy, magician, and roommate of Temple, Lt. Carmen Molina takes on the case, but Max eludes her as he pursues the Synth, a dastardly group of magicians hanging out at the Neon Nightmare, a club with more secret passages than cats have lives. While Louie and his saucy kid Louise are chatting up birds in the atrium and tagging along after Max and Kitty, who collide on a desert highway, Matt is consumed by guilt and Temple totters around on impossibly high heels. Gandolph the Great, who’s been dead for years, returns, and Louie’s vain and wicked inamorata Yvette pops up on that atrium balcony. There’ll be more Catholic soul-searching by Max, Matt, even Molina before the exequies for the series’ archvillainess. The plot is silly and congested, and the cats so insufferably cute they’ll make you run right out and buy a dog.